In 1951, Ray and Charles Eames, architects and furniture designers, hosted a gathering at their new home. 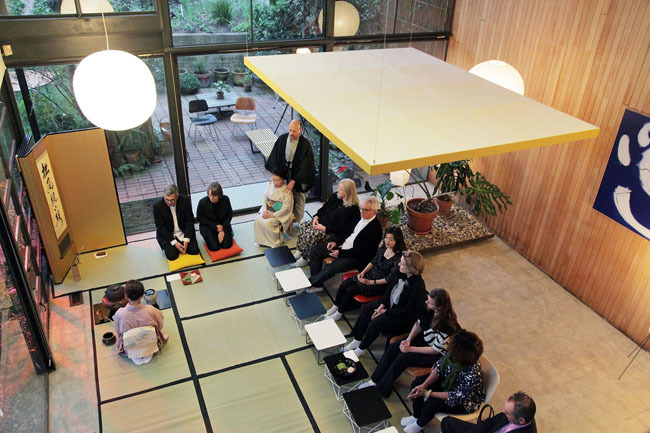 Given their great interest in world history and Japanese culture in particular, the Eames chose as their guests leaders from the worlds of state, screen, and the arts, to participate in a traditional Japanese tea ceremony. Mrs. Shizuye (Sosei) Matsumoto and her student, the actress Shirley Yamaguchi, served tea to these guests, who included silent film star Charlie Chaplin, sculptor and furniture designer Isamu Noguchi and other celebrities. Mrs. Matsumoto has fond memories of this significant event, as she also has photos where she and her husband, Eddie Matsumoto, are seen in the Eames house with the 15th-generation grand tea master of Urasenke, Hounsai Daisosho. Sixty years later, the Eames family and foundation asked Mrs. Matsumoto to honor this important moment by recreating that tea ceremony as a fundraiser for the Eames Foundation. The organization is preserving and restoring the Eames home, located in Pacific Palisades, overlooking Santa Monica Bay. This event occurred on March 10 and was a wonderful experience for the patrons of the Eames Foundation, as well as the grandchildren of Eames, Lucia Atwood and Eames Demetrios, who are on the board of the foundation and organized the event. The event was a success with the 12 guests enjoying tea served by Mrs. Matsumoto and five of her students. Her niece, Etsuko Ota, performed the tea ceremony using the same utensils that were used on that night in 1951. There was a hanging scroll with the calligraphy “the sound of the kettle is like the wind through the pines,” written by the 14th-generation grand tea master, Tantansai, of the Urasenke School of Tea in the 1940s. Mrs. Matsumoto imparted that the opening of the teahouse at the Huntington Library this month has brought back memories from 60 years ago, when she first met the Eames through their friend and the architect of that teahouse, Mitsuhiko Sen, younger brother of Hounsai. The teahouse itself was originally dedicated at the Pasadena Buddhist Temple. Now, after being deconstructed and restored in Japan, it will be dedicated at the Huntington Library. The current 16th-generation grand tea master, Zabousai, will be in attendance to assist in the grand opening of Seifuan teahouse as well as to celebrate Mrs. Matsumoto’s over 60 years of teaching tea. The year 1951 was a very special year for Mrs. Matsumoto since she began teaching tea in January 1951. Six months later, the Urasenke Tankokai was established on June 10, 1951. 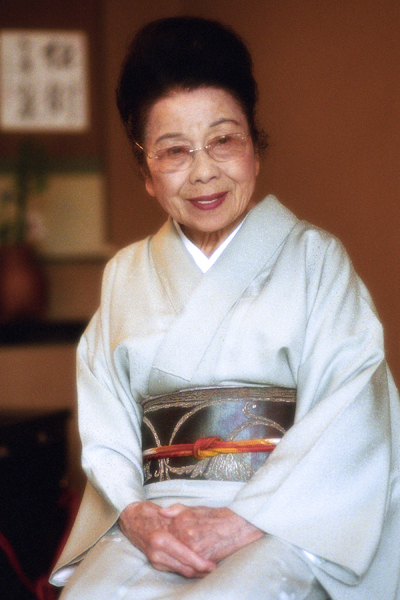 This was also the year she was invited to perform a tea ceremony commemorating the signing of the U.S.-Japan Peace Treaty in San Francisco, where for over four days, Hounsai Daisosho and she served tea to many American and Japanese officials, including President Harry Truman and Prime Minister Shigeru Yoshida. At the March 10 gathering, the guests were delighted to meet Mrs. Matsumoto and to participate in a truly “ichigo ichiye” (one time, one meeting) tea gathering, creating new moments to be cherished by all.